Two Fridays ago, I ended up swinging by Newpark Mall after hearing about the Street Eats event there with dinner service from 4:30pm -9:00pm. I met up with Jonny, who I met through my various food truck adventures there. When I got there, we made our way to check out Grillstars since I’ve never had them and Jonny told me they were really good, so we got in the line. While in line, I ran into another food truck fanatic, Bill (@foodtrucknerd) who was nice enough to let me try his fried pickle from GrillStars. Bill, one of my food truck buddies who I see all the time at events. After placing our orders, we made our way to Mobowl to say hi to the guys there. They’re always so cool and friendly, I always have to say hi to them just because they’re so nice all the time. Who doesn’t like being around nice people? I didn’t eat them today because we had eaten at their truck earlier in the week, but I always love supporting them. Anyways, the GrillStars truck was pretty crowded especially since I think they’re one of the newest trucks on the scene, but the line seemed to go pretty fast. It was also pretty cute because it seemed to be family owned or run because there was a cute little girl helping the woman take orders at the front. Jonny ended up ordering the BBQ chicken since the ribs were out by the time we got there and I ended up trying their BBQ Nachos. Here’s some pictures of our food. The chicken was good and the nachos were really good. I did want to try some cupcakes though. So, we checked out the That’s Sweet Dessert truck. There were so many options, Jonny and I decided to try a few of them. We got the Salted Caramel, the Vanilla Strawberry and the Maple Bacon. I liked the Salted Caramel and the cupcake consistency was good to where it wasn’t too sweet, but just sweet enough. I ended up getting the Maple Bacon for a friend of mine who lives bacon/pork, but he said it was good as well. Overall, not a bad event. It was crowded enough where all of the trucks were getting fairly good business, but not so crowded where the lines were overwhelming. We never waited more than 5-10 minutes to get our food at any of the trucks. I definitely want to try to check them out in the future. Not sure when the next event is, but if any of you guys find out, let me know. Eats will be July 22nd. Yes, I’m on a Si Food Diet…. I was still having major latin food cravings so I hopped on yelp and searched by most popular Mexican food and ended up seeing Dia De Pesca (yelp.) met up with Amit to go check out Dia De Pesca since I still haven’t been able to satiate my latin food craving. The place is extremely cute and cool looking. Strangely, it reminded me a bit of a trailer park in New Mexico or Southern California, but to me that was a bit of an appeal. It is a bit confusing at first since when you walk in, it’s an open space with a few trailers/trucks and a standalone building. Do you order at the truck or do you order at the building. Everyone there was really nice and helpful and explained the process to us, so we went into small building to order which had a few tables set up inside there as well. There are quite a few items on the menu and we wanted to try a few different things. Once you order they give you a number and you find a table and they bring the food out to you. The numbers themselves are also pretty cute. They’re old playing cards. 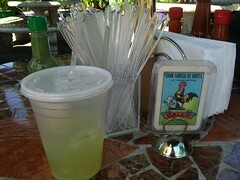 They have a few drinks as well like horchata, some strawberry fruit drink and a lime cucumber drink. I ended up getting the cucumber drink, which was really refreshing. The food came out pretty quickly from the taco truck. They deliver it to your table and the food was pretty fresh. The ceviche came out more like a crispy torta type dish. 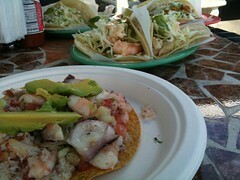 I ended up getting the mixed seafood ceviche, which was pretty good. This was probably my most favorite dish, but lately I’ve been into simple things. It was pretty simple with little extra sauce, just the lime juice and the seafood, but all the items were fresh. We also got a variety of tacos as well. 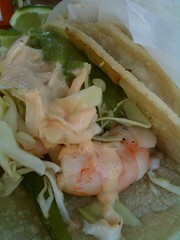 We pretty much tried all the tacos on the menu and I think once again, my favorite was the shrimp taco. This weekend San Jose will get what might be the most unique movie-watching experience I’ve heard of: the “inaugural” Bean Bag Film Fest, hosted by the San Jose Woman’s Club. You can enjoy a double feature of cult films each night for three nights, seated in a comfy bean bag chair (first-come first-served), while sipping a pleasant adult beverage, in a beautiful art deco ballroom. There’s also food provided by a different food truck each night. Thursday is Shaun of the Dead and Zombieland with Tikka Bytes food truck. Friday is Harold and Maude and Rushmore with Tac Gos food truck. Libations on Thursday and Friday include beer and wine selections. Saturday is a special 21+ event with Swingers and The Big Lebowski with BBQ Kalbi and cocktail selections including White Russians (natch!). For more info, check it on the SJ Woman’s Club website. Gorditas Universal serves vegetarian Mexican fare five nights a week. Food trucks have developed over the past couple of years into a way for entrepreneurs to bring specialty foods to a wide audience on a modest budget. In the south bay we have regular visits from food trucks that provide premium ice cream with karaoke, upscale cupcakes, fresh-from-the docks seafood, and bul-go-gi burritos (see our earlier article). Gorditas Universal has been providing a unique cuisine option for years, but managed to miss out on the spotlight that’s been put on the trucks you see at events like Zer01 and Left Coast Live. Partly, their low profile may be because they don’t travel to trendy events. Instead, Wednesday through Sunday evenings, from late afternoon until the wee hours of the morning (or when the food runs out), you’ll find Gorditas Universal set up at the corner of East Julian and North 26th Streets, in the parking lot of the Shan corner market. 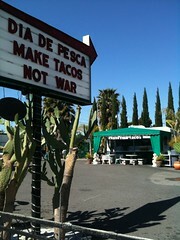 The truck serves simple Mexican taqueria or snack food including tacos, burritos, quesadillas, and enchiladas. 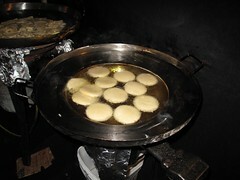 As the name suggests, the specialty is gorditas, or little fatties. These are small masa cakes, deep-fried to a golden color, then cut open and stuffed with various tasty choices, cabbage, and cheese. Fillings include carne asada, barbacoa, and three different preparations of chicken. The twist is that all of these choices are completely vegetarian, although many of the customers don’t seem to notice the difference from the usual taqueria fare. Flavorful sauces and fresh roasted chiles mixed in with the “meat” make the food delicious even for people who normally wouldn’t touch a piece of tofu, seitan, or wheat gluten with a long stick. Potato, refried bean, and mushroom fillings are also an option for those who want their vegetarian food to actually look vegetarian. The atmosphere is very friendly: with just a few tables set out under the tarpaulins, you’ll usually find yourself sharing a table and making new friends. Chips, salsa, and roasted peppers are set out on the table for snacking while you wait for your food. Prices are very affordable, with gorditas at $1 each, or $10 for a dozen (which you’ll need a couple of friends to help you finish). If you’re looking for a quick late-night snack, or trying to find a dining choice where vegetarians and non-vegetarians will find something flavorful and delicious, or just want some inexpensive but tasty Mexican food, check out Gorditas Universal.